The importance of the mundane, why the mundane must go everywhere and why "mundane" must be very good. Excellent junction designs along here. Occasionally we've covered exceptional examples of cycling infrastructure on this blog. It is not only this blog, or only the Netherlands that produces such infrastructure. Such projects, big and impressive, often large bridges, tunnels or cycle-parking facilities, are photogenic and prestigious. They can also be the subject of press releases from the city in which they are built, or the designers and they're very popular amongst bloggers, on facebook and twitter. However, an emphasis on such things paints a false image. It can be a pleasure to use exceptional pieces of infrastructure, but I'm uneasy about the amount of attention which such things achieve. The whole world doesn't look like the exceptions, not even to a cyclist in the Netherlands. After all, the very word exceptional means "deviating widely from a norm". By definition, almost all infrastructure is not exceptional but is actually just average and most journeys will be made for the most part on that average infrastructure. junction design and kept clear of ice in winter. Prestige projects are very popular with politicians who want to make a name for themselves, and they can be great to have as an extra. However, it is the quality of design of the everyday, mundane infrastructure which forms the largest part of most peoples' journeys which is most important to encourage a high cycling modal share. This is what most people will use for most of their journeys. Similarly, some places make quite a lot of noise about having a few good cycle paths, or a network which covers part of a city. Nice photos can be taken on those cycle paths and they seem good so long as we gloss over the problems which occur at junctions and that they don't take people to all their destinations. Giving too much credit to a place which has an inadequate network also misses the point. A proper finely spaced grid of high quality routes which cover everyone's journeys is a prerequisite for a high cycling modal share. Exceptional pieces of infrastructure spread spread thinly across the country are only useful to a minority for some of their journeys and if the "good" cycle-paths are exceptional enough to be noteworthy, they're in the same category. is very important that cyclists get to use direct routes. Good quality is far more important than a flashy name. So let's hear it for mundane, common, ordinary, unexceptional and boring infrastructure. Forget the the idea of exceptional stuff, it is the mundane which needs to be good and it's that mundane yet really extraordinarily good infrastructure which needs to go everywhere. How much extremely good infrastructure do you need ? That depends on how much cycling you want to see. It should be no surprise that expenditure on cycling is proportional to modal share. The truly exceptional thing about Dutch cycling infrastructure is that in this country, "mundane" infrastructure is of extremely high quality, is excellently maintained and is absolutely ubiquitous. This mundane infrastructure in the Netherlands is what makes the high modal share possible because it keeps cyclists away from cars and trucks for all of every journey. This very high quality infrastructure is available to everyone so that they can make a large proportion of their journeys by bicycle without any nasty surprises, ever. This extremely high quality grid of cycling routes is kept open even during road works or when there has been snow. Anyone who wants to cycle is enabled to do so as much as they wish to. This maximises the modal share for cycling, whatever the demographic mix of any particular area. Old, young, rich, poor, locally born people and immigrants all cycle in the Netherlands. and watch a video about this particular bicycle road. The importance of having a tight grid of high quality routes to encourage the use of bicycles was a lesson learnt way back in the late 1970s and early 1980s and still just as valid today. Don't let your city get away with offering just a few prestige projects or just a few particularly good routes. Don't let them get away with offering indirect routes which don't go to all destinations efficiently. Such proposals may sound good, they're great for boasting about, they're great for photo shoots and publicity purposes and politicians love to have their names associated with big projects. However, a few pieces of exceptional infrastructure cannot cause an appreciable change because for most people making most journeys in other parts of the same city, the experience of cycling will remain the same as it was before they were built. Average Dutch infrastructure is what is featured most on this blog. It's also what we demonstrate most on our Study Tours to show how the infrastructure works and why it enables cycling so much. We take the routes that normal people take to destinations that normal people go to. We use the infrastructure that normal people use. There is no point in cherry picking a few particularly good pieces of infrastructure as this only creates a false image. It wouldn't show how people actually cycle on a daily basis and what is important to make this high rate of cycling normal. So what is this "grid", then ? It's simple in concept. Within a few pedal strokes of home, everyone needs to be able to reach infrastructure on which they not only will be safe but on which they will feel safe. It must take the cyclist to every destination in a convenient manner and it must be contiguous. No stops and starts, no need to "take the lane" to cross large junctions. Main cycle-routes should be separated from each other by no more than 500 metres. Secondary routes fill in between to get the spacing down to about 250 m and neighbourhood routes fill in the gaps where needed. your whole country like this. 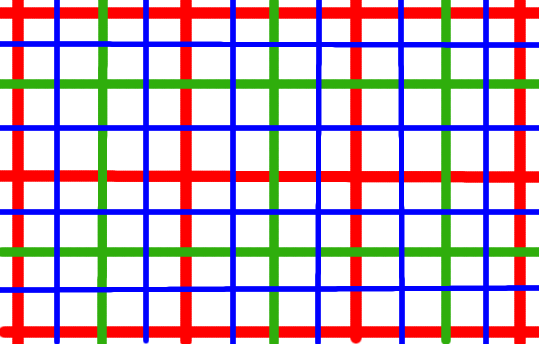 green = secondary, blue = local links. In practice, the grid is of course not arranged on strict North-South / East-West lines, but curves with the landscape, runs alongside canals and rivers with bridges to cross periodically, goes across the countryside and through the towns and cities that people live in. However, the everyday experience is as if it were such a strict grid. For instance, from our home we have less than 200 metres to cycle in a quiet culdesac (30 km/h limit) to reach either of two high quality four metre wide cycle-paths which take us to every possible destination by bike. See the actual map of primary and secondary cycle-routes in Assen in a previous post about "the grid". Groningen's great success in cycling has lead to problems which are not so common elsewhere. One of these is the enormous number of bicycles which need to be accommodated. Sometimes the pavements (sidewalks) are so attractive for cycle parking that there is little space left for pedestrians to walk on. In some of the busy areas where cycle-parking puts pedestrians under pressure, Groningen uses red carpets to indicate places where you may not park your bike in order to preserve some space for walking. Our study tours include a visit to Groningen where you will see the red carpet in use. In the next few days we'll stop taking bookings for the September Study Tour. For more details, or if you already know that you'd like to come along, please visit the Study Tour webpage. Some of the locations in the video are visited on the tour. Residential areas frequently suffer from problems caused by car parking. This can take the form of cars parked on the road getting in the way of other drivers, cars parked on the road causing cyclists to have to swerve around parked cars (can be dangerous especially for less confident cyclists) or cars parked on the pavements (sidewalks) causing nuisance and danger for pedestrians. driving over only at a slow speed. 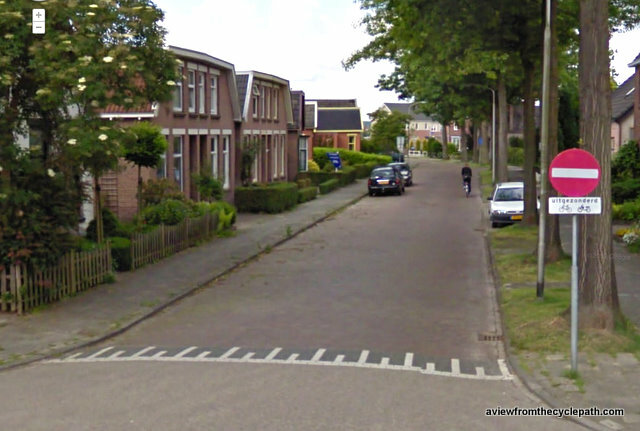 Such problems can be addressed by redesign of the street, and there are many good examples of this in the Netherlands, including on many streets in Assen such as that shown above. The first picture, from Google Maps, shows how the street used to look up until very recently. The second was taken today as I cycled along this street. These houses and the street which they are built alongside, date from the 1930s but existing trees on just one side of the road were recently taken up and replaced with trees on both sides of the road combined with parking bays. Note that while the direction of motorized traffic was changed recently, this street has been one-way except for cyclists for some years. Routes for cyclists are unravelled from those for drivers. This is a useful through route with a bike, but not with a car. This makes yet another example of how segregation of modes is achieved without building cycle-paths. This street in the newly built suburb of Kloosterveen uses the same design to keep cars off a series of streets which together form a direct route only by bike. This is the only photo in this blog post of a new development. A different way of achieving a similar result can be to use concrete setts through which the grass can grow. In some areas, bollards are used to control parking, This is a one-way street with cyclists excepted. The same street, showing how there are again angled kerbs to climb a low speed in order to park one's car. Sometimes, parking bays are built on-road, alternating from one side to another. This is again a street which makes a good through route for cyclists (linking up with the bridge shown in this video) but which goes nowhere for drivers. In this case, the permitted side of the road for parking alternates, which makes the road meander and serves to slow traffic. All the streets in these photos have 30 km/h or lower speed limits. In this case with a smooth speed bump with a cycle by-pass on both sides and parking bays for cars on one side of the street. Again this street does not offer a useful through route by car. The only street in Assen converted into a Woonerf. Here the speed limit is walking pace. Note that cars can park on one side only. An older treatment showing parking bays on both sides of the road to achieve a similar result. The bays can be made quite attractive, improving the green look of a neighbourhood rather than resulting in residential areas looking like car parks. This process of improvement is continuing right now on streets across Assen as more residential streets get this treatment. Where possible there is always enough car parking so as to avoid parked cars becoming a problem. This is how drivers are persuaded not to leave their cars in places which cause problems for cyclists and pedestrians. In the Netherlands, people are not discouraged from driving by providing inadequate car parking spaces (as has been done to disastrous effect in the UK) but are provided adequate spaces to park their cars while cycling is made attractive by making cycling routes more convenient. The highest modal share for cycling in the world works due to carrots, not sticks.